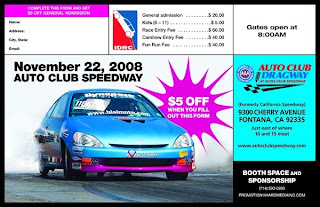 IDRC is holding an event at Autoclub Dragway at Fontana on November 22.There should be several Nissan Skyline GT-Rs out at the event running down the quarter mile. D Sport's 9 second R33 GT-R. D Sport's 10 second R33 GT-R. RB Motorsports is going to bring out several cars to run. Everyone is welcome. Maybe even some R35 GT-R's. IDRC drag racing.